Lacy Goostree in 1961 and in a recent photo. Lacy W. Goostree, P.E., W5LMG, died on Nov. 8, 2006. He was 87. Lacy joined RCA in 1990 and became a Fellow in 1994. Lacy was born in Dallas. He graduated from Southern Methodist University with a BSEE degree in 1941. He became a registered professional engineer. He earned his amateur radio license in 1950. He worked as a development engineer for the General Electric Company (GE), including an assignment to MIT Radiation Labs. His career at GE spanned 1941 to 1971, and included work as a manager of marketing for the company. He worked for Transdata Corporation from 1971 to 1982, and then as a consultant as Lacy Goostree Inc. until retiring in 1989. “Lacy built the Communication Products Department of GE from the corner of a bench at Electronic Park in Syracuse, New York, to a $600 million-per-year division,” Ray Minichiello, P.E., W1BC, told me. Ray himself is a former GE manager, and an RCA Fellow and board of directors member. “For many years until 1959, Lacy was manager of marketing for the division. Lacy transferred to the General Electric Computer Department in Phoenix in late 1959 as manager of marketing until 1971 when the department was sold to Honeywell, and Lacy then retired,” Ray said. Lacy received GEs Charles A. Coffin Award in 1950. “The Coffin Award is the highest award of General Electric Company, presented to the very few who have contributed the most,” Ray said. 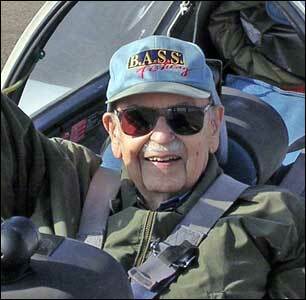 Ray told me that Lacy was an avid private pilot and a dear friend of another RCA Fellow, Jerry Stover, W5AE. “They journeyed together through college,” Ray said. Lacys wife Milledge predeceased him. He is survived by son Douglas Goostree and his wife Jeannette; daughter Gloria Donahoe and her husband Jack; four grandchildren, Michael Donahoe, Kellie Henderson, Greg and Brad Goostree; five great grandchildren, Benjamin, Silas, Max, Sadie and Kaden; and sister Annah Beth Peterson. This entry was posted on Monday, February 19th, 2007 at 1:27 am and is filed under Obituaries. You can follow any responses to this entry through the RSS 2.0 feed. You can leave a response, or trackback from your own site.